Redesigned Bifurcated Cabinet. Assembled in Hope, AR. Finish - Black. Bonus - Includes Monster M-Series Bi-wire cable. WEIGHT 90 lbs. (40.8kg) ea. ENCLOSURE TYPE Bass reflex via dual rear-firing ports. ENCLOSURE MATERIAL MDF. 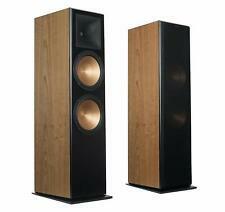 (2)RF-7 III Floorstanding Speakers. RF-7 III Floorstanding Speaker. 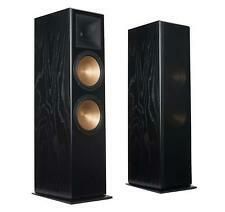 (2) RF-7 III Floorstanding Speakers. When paired with the Tractrix horn-loaded compression drive it provides speaker efficiency highest in its class. Redesigned Bifurcated Cabinet. Dual Tractrix Ports. We've got you covered! Everything you need! Don't see it?. ASK, We'll get it! unless there is a manufacture defect. Free Technical Support! Item location: US, United States. Within the US, United States. Klipsch RF-10 RF-7 RF-35 RF-3II And Others Speaker Feet. Condition is Used. Shipped with USPS Parcel Select Ground. Dynamic 1.75" titanium horn-loaded tweeter, dual 10" high-output. PRICED AS AN INDIVIDUAL SPEAKER IN CHERRY FINISH. The RF-7 II is complete with our proprietary Tractrix® Horn technology which produces a unique combination of precision, clarity and effortless power. Excellent foot, with both screws included. 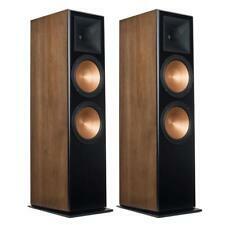 Klipsch RF-7 II Black-ash reference Speaker AUTHORIZED-DEALER $1600 each list ! In addition to the improved sound quality, the look of “big sound” has been redefined throughout the line with sophisticated cabinetry, refreshed logos and rounded feet. Dynamic 1.75" titanium horn-loaded tweeter, dual 10" high-output. Speaker was never abused. Cash only! 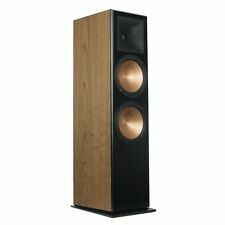 Klipsch RF-7 III Floorstanding Speaker - Each (Black). Authorized Dealer! 100% Authorized Dealer. We stay on top of changes in technology and what’s new in the marketplace to make sure we have the best value products in every range. All Categories. The HiDEF Promise. These speakers are 43 years old and now good as new again. Re-installing the woofer was a 5 minute process and the sound was great. Best wishes. The instructions and Youtube video made things very easy to follow. 2 1/2 Way Network Crossover Design. Dual Tractrix Ports. 90x90 Compressed Molded-Rubber Tractrix Horn. All-New 1 3/4" Titanium Compression Driver. Redesigned Bifurcated Cabinet. All in original boxes. All black/black satin. Set includes "Reference Series powered subwoofers shatter your expectations for deep driving bass by playing louder and going deeper than significantly larger designs creating the most dramatic intense bass you've ever heard or felt. Assembled in Hope, AR. Dual Tractrix Ports. All-New 1 3/4" Titanium Compression Driver. Dual Tractrix Ports.